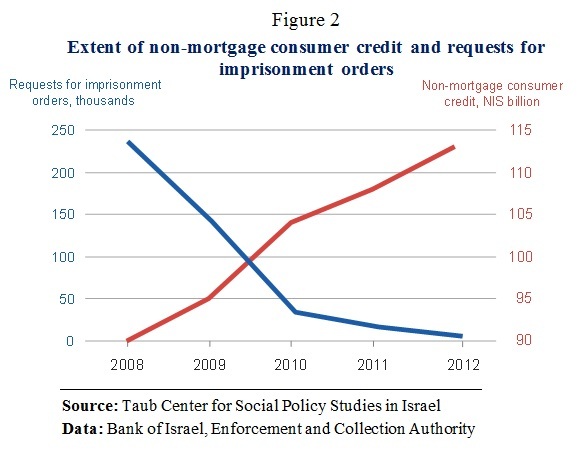 A study on Israel’s treatment of insolvent debtors by Dr. Asher Meir, a Research Fellow at the Taub Center for Social Policy Studies in Israel and Senior Lecturer in Economics at the Jerusalem College of Technology, presents new findings on the functioning of the consumer credit market in Israel. The widespread idea that Israelis borrow with abandon but are slow to repay appears to be a misconception according to the study by Meir. 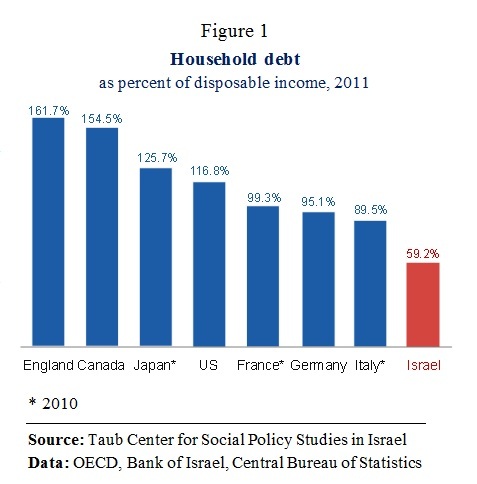 The ratio of household debt to disposable income in Israel is lower than any country in the G7 and is less than half the average level for these countries (Figure 1). Rates of missed payments on loans of all kinds are no higher than those in comparable countries. The Taub Center study found that one out of seven Israeli adults has an open collection file at the Enforcement and Collection Authority, and that files remain open for prolonged periods. According to the 2012 report of the Enforcement and Collection Authority, around 755,000 individuals have open files in the Authority. Dr. Meir comments: “These figures point to a problem of worrisome extent, affecting 15 percent of the adult population of Israel.” About half of the files remain open after four years. The study found no evidence that imprisonment of debtors improves the credit market and claims that it is liable to harm the market. Dr. Meir explains: “Imprisonment for debts is a severe punishment and very exceptional on an international basis. In addition, the threat of imprisonment is a drag on credit demand and thus on the total level of demand in the economy. When leniencies to this policy have been introduced, including the virtual elimination of imprisonment for debtors in 2011,no negative impact was found on credit markets, and even collection was not negatively impacted.” Figure 2 shows that in recent years,the extent of household loans other than mortgages has continuously grown even as the threat of imprisonment has continuously declined. The Taub Center study found that the Israeli approach, in which debtors face intrusive sanctions for inability to pay routine debts, is not accepted throughout Europe and North America. Even when a debtor who is recognized as being “of limited means” (i.e., unable to meet the original conditions of the loan repayment and subject to a revised payment schedule), he can face sanctions such as limitations on his bank account, revocation of credit card, and prohibition on leaving the country. This is in sharp contrast to most countries, where restrictions of this nature apply only to debts relating to child support. 1. Continued development of an effective consumer credit scoring system would benefit consumers and the credit market as a whole. 2. There is no justification for punitive sanctions on limited means debtors, or for imprisonment for non-payment of routine debts. 3. There is a need for transparent and equitable standards for a fresh start.